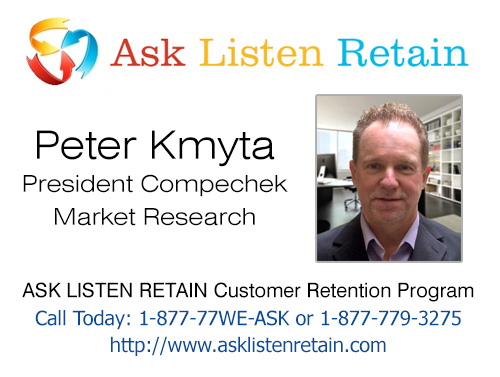 Home / Ask Listen Retain / Are You Losing Customers or Keeping Them? You might be surprised at the answer: the average business loses up to 30% of its customers every year – and 50% of its customers over five years! A loss is still a loss, however, and lost customers mean lost goodwill, lost customer loyalty, lost word-of-mouth, loss of an established business relationship, and ultimately lost sales, even if you do recruit new customers. Consider this: with a customer loss rate of 15% each year (since you’re probably better than average!) and an additional 15% new customers each year, your customer base is basically the same size form year to year. But if you only lose 5% of your customers each year, and add 15% annually, your customer base is growing by 10% each year. Wouldn’t you rather be doing that? And consider this, too: when times are hard, and every business is struggling to maintain as much of its customer base as possible, you may not be able to count on bringing in a sufficient number of new customers to make up for your losses. Every lost customer may be just that – a lost customer, with no new customer walking in your door as a replacement. So here’s the bottom line: if you understand how to retain a customer who you might otherwise have lost, you aren’t just reducing your losses – you’re automatically helping your business grow. The art and science of customer loyalty and retention is one of the most important keys to making your business succeed and expand – even in difficult economic times. And the first step in understanding how to keep your customers is to understand why they’re leaving. To do this, there is no substitute for a first-rate system for measuring customer satisfaction – and dissatisfaction. Compechek’s survey-development experts, along with its professional survey-taking teams, and the ASK-LISTEN-RETAIN system for survey analysis and reporting gives you a clear picture of what makes you customers happy, what makes them unhappy – and what might make them walk right out the door. When you’re armed with that kind of information, you’re in a position to take action and keep your customers, rather than just watching them walk away. And that puts you in the position of being able to expand your business, which is really what you want to be doing, isn’t it? The customers you have today should be your customers tomorrow, and next week, and next year, and the year after that as well. You don’t have to settle for anything less.